The ultimate predator, sharks have captured the minds and attention of anglers world wide. In the Florida Keys we have sharks in pretty much every body of water we fish in. From 12 inches to 1200 feet of water. Fishing for sharks might be the most entertaining thing some anglers ever do. Here in the Florida Keys we shark fish in the shallows. This makes it even more fun, exciting and interesting. Fishing for sharks in the shallows really opens up an opportunity for fishermen to see how the sharks act, learn feeding habits and sight cast to them right off the bow of the boats. Now thats Cool! 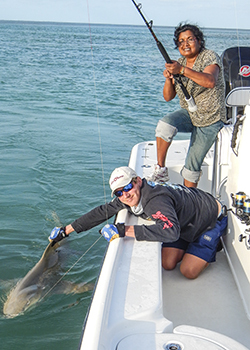 Whats even more fun is that although we catch sharks in shallow and deep waters, our Florida Keys shark fishing charters are done in the calm, clear waters of the backcountry where the scenery and the fishing are amazing. Taking people shark fishing is a lot of fun for us as fishing guides. We really love the look on peoples faces when they have their first "close encounter". Fishing the shallows for sharks adds so much to the thrill of it all because our anglers can see them coming as the sharks smell the chum and start hunting down the baits. Its all right there in front of them like a theater - except its real! Ranging from 5 - 500 lbs its important that our anglers have the right equipment to do the job. We supply all the gear you will need to tackle sharks of all different sizes. it helps us allot if we know your goal in shark fishing like how big and what level of fight you would like. These are all things you will be able to discuss with your fishing guide long before you go. We offer 4, 6 and 8 hour fishing charters for sharks up and down the Florida Keys and Key West. 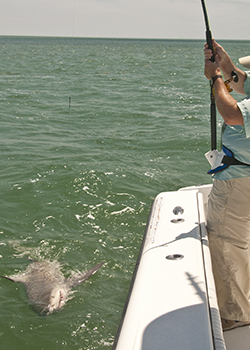 We use bay boat for our most exciting experiences to get you right up close and personal to these amazing fish. We can take 1-4 persons on board our bay boats. Anglers can use regular conventional tackle, spin fishing tackle or some anglers request fly fishing gear. Its all provided to you with the cost of the shark fishing charter. Beginner to experienced is all welcome on this fishing charter. We can entertain the most seasoned anglers by increasing the technical nature of fishing or make it super easy for less experienced anglers by pursuing an easy quarry. To make a shark fishing charter reservation the best thing to do is call us directly we are always here standing by to help you put your Florida Keys fishing charter together. Tell us where you are staying and what type of experience you are looking for. We will offer you some suggestions and put you in touch with a professional fishing guide that we know will take great care of you or your money back.